Friday November 22nd, 1963, President John F Kennedy was assassinated in Dallas Texas on route to the airport. The government accepted the official findings as hard evidence stating there was only one shooter who shot 3 bullets. 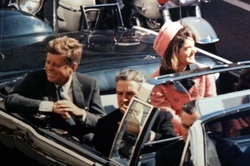 There are many conspiracy theories related to JFK's death. Was assassinated at 12:30 p.m.
View Reaction to the assassination of John F. Kennedy and over 3,000,000 other topics on Qwiki.